The CanStage production of Amadeus begins with a surprise--a young girl plays Mozart on the piano, one prodigy playing another. Later we're surprised that the Viennese gossips, unlike everyone else, are in modern dress and that Ken MacDonald's sets pay hommage to Mondriaan not the 18th century. The anachronisms remind us, rather pointlessly, that the play is a modern construct. But for surprises, that's it. Soon into the production it becomes evident that director Morris Panych has nothing new to say about Shaffer's highly overrated, crushingly middlebrow play. We certainly don't go to Amadeus for historical insight. The programme notes make clear that Mozart died of natural causes and that Salieri, who was not a tortured or mediocre composer, had nothing to do with it. Without the historical fantasy what's left is one long pretentious kvetch, larded with hokum about forgiveness and redemption, that some men are geniuses and others are not. Panych's production only makes the play's hollowness more obvious. Ultimately, Amadeus works best as a vehicle for powerful acting. 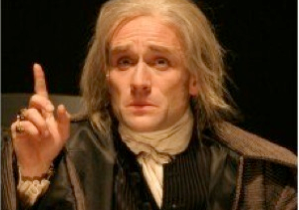 Here, however, David Storch makes Salieri too earnest to be a villain. He never brings out the malice or humour in Salieri's Iago-like hypocrisy. Matthew Edison's attempts to capture Mozart's natural childishness do the opposite by making him seem an affected dandy. There are some consolations. As the Viennese gossips, Damien Atkins and Dov Mickelson catch the right tone of false indignation. Shauna Black is affecting as Mozart's wife Constanze. And Robert Persichini is very funny as the befuddled Emperor Joseph II. Note: A version of this review appeared in Eye Weekly 2003-10-16. Photo: David Storch as Salieri. ©2003 CanStage.